A lot of us are willing to spend lots of money to make our home look good. From investing in quality curtains to furniture pieces, we’ve got it all covered. So, it is only justified for us to be extra careful about it and keep it looking clean for making it last as long as we possibly can. When it comes to owning a futon, at one point or another, you will find yourself dealing with the mattress or fabric getting stained in some way. This especially happens if you have children and pets at home. With them in the house, futon stains are just completely inevitable. You can go old-school and do what your parents did when you were kids and put a plastic cover over your furniture. However, even as you read that, we are certain that it brings back those haunting memories of how uncomfortable they are to sit on, and worse, how ugly they made the furniture looked. Thankfully, we have come a long way from then. Today, we are flooded with tons and tons of options for futon covers. Not only do these covers serve the purpose of protecting your furniture, but they are available in multiple colors, design options, and even sizes. So, if you are in the market for a futon cover, then you are in luck. In this article, we will be doing an in-depth review of the SIS Covers Bali Futon Cover. Full cover 54" x 75"
Three-sided zipper closure for easy removal. SIS Covers is a company that was created back in 1987 by some twenty-something sisters named Cyndi Ritger and Shari Hammer. These sisters wanted to make a living while being with their young children. Luckily, they thought of the brilliant idea to create futon covers, amongst several other things, that are stylish and artistic and stand out from the several on the market presently. Over time, the company has expanded from an 800 square feet workspace to a whopping 76,000 square feet. The sisters continue to work hard to provide their customers with only the best products. The company has given a lot of thought behind the design of this futon cover. While they offer only one design and color, they have gone above and beyond to ensure that it looks amazing. 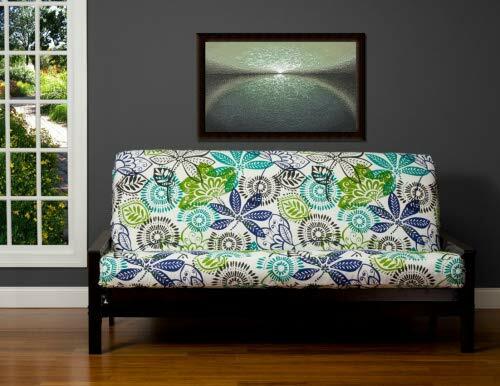 The base color of this futon cover is white, and it has an abstract flower and leaf design in dark blue, green, and turquoise. There are also these black circular designs all over. This may sound like a whole lot of design and color, but they blend very well together. Since they offer only one design, the company has ensured that everyone can take full advantage of this futon cover. Hence, they have made this cover in multiple sizes. These sizes include Ottoman size (28 x 22 inches), a chair size (28 x 39 inches), a twin size (39 x 75 inches), a queen size (60 x 80 inches), and a full size (54 x 75 inches). You can buy this cover for all your furniture so that they all can match. SIS Covers have taken the utmost care with the stitching for their futon covers. Every cover is machine-stitched and is strong too so that it will last you for a very long time. Furthermore, the full size and queen size futon covers have a three-sided zipper closure. Whereas the chair, ottoman and twin size futon cover come with a two-sided zipper closure. These zipper closures make it very easy to put on and remove this cover. Cleaning this futon cover could not be any easier. Simply pull the cover out and toss in the machine. Wash as per the instructions mentioned on the cover, and you are good to go. The company takes great pride in the quality of this futon cover. It is built from high-quality 100% polyester. However, if you find yourself dissatisfied with the material or the construction of the cover, the company will correct it or exchange it for you. The SIS Covers Bali Futon Cover is a great product for people who not only need to protect their furniture but also make it look fancy in the process. The futon cover has an excellent design that is sure to match almost every home décor. Furthermore, the cover is made from high-quality 100% polyester, which is built to last. To make things convenient, the cover comes with three-sided zippers for the full and the queen size covers and two for the other ones. Removing and putting the cover on is a piece of cake and the cover is machine washable. We decided to test the Bali Futon Cover once more by comparing it to a similar product. Since the market is flooded with so many futon covers, this task was definitely not difficult. We found Pengxiang Futon Cover to be the most similar to this cover. Let’s see how they both hold up. On the surface, the two covers are basically the same. However, the Pengxiang Cover’s only advantage is that it is available in multiple colors. All these are just solid colors with not so attractive designs, though. Furthermore, this cover does not share the same high-quality as its counterpart, which means it won’t last as long. Lastly, while there may be so many colors and designs to choose from, the company has offered only one standard size and no more. SIS Covers Bali Futon Cover is an excellent product for those in need of a futon cover. Not only will this protect your furniture but also take your home décor to the next level by adding color and life to it. You can buy these in multiple sizes to maintain uniformity all over the house. Since it is made using high-quality materials, the cover is guaranteed to last you for a long time, making it absolute value for money.